Usually, our workstations have Windows OS and we need to connect to Solaris Unix OS on SSH. That’s why we are using Putty application. The Samba daemon must be available and activated (in order to support Windows share and map drive). In this sample, the database is in /myApp/db/test_db path and it’s called, total. Basically, database files name doesn’t change, only the folder name (instead of test_db). In my example, the application port for this database it’s 2540 (might be changed). 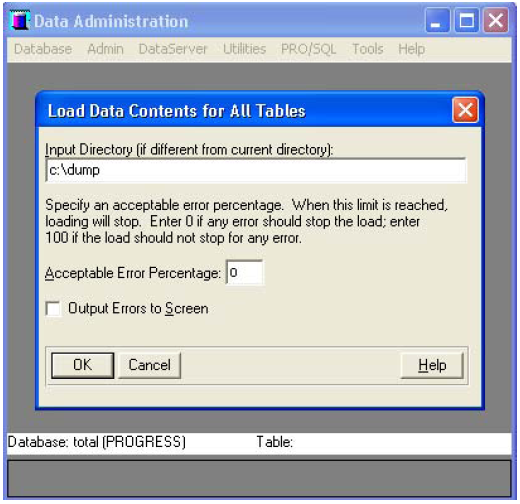 The database and dumps loading process it’s realizing using Database Administration tool, available in Progress’s Windows suite. The suite path it’s: START -> Programs ->PROGRESS -> Data Administration. 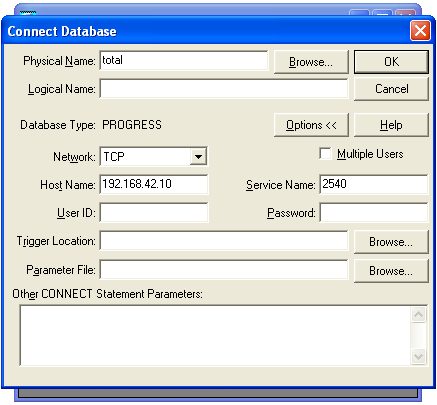 Launch this application and select Database menu, Connect option. It will appear Connect Database window and we will complete it as in next image. After that we select OK button. From this capture you can observe the database name, the network protocol (TCP), Progress server’s IP (192.168.42.10) and our opened database port (2540). Once successfully connected to this database, all the application functionalities will be available for us. If we want to load the database we access the menu: Admin -> Load Data and Definitions -> Data Definitions (*.df file). 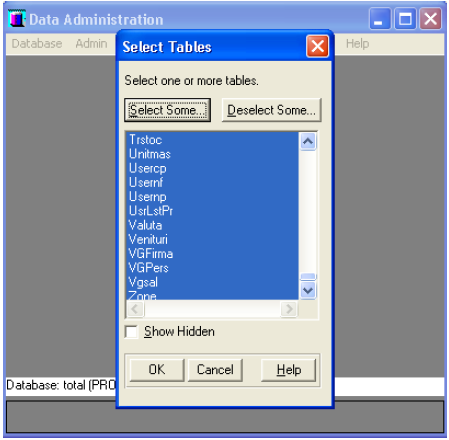 We select the table’s definition file from the local disk and select OK button. Dumps files stores database information. If we want to load data content then we have to follow Admin -> Load Data and Definitions -> Table Contents (*.d file) path. Select Select Some… button and then select all tables (*), then press OK. If we press OK button, then we will get a new window where we have to introduce the folder path that contains the dumps data files. Attention! This operation takes time. In this step, following last step, we have already the database with structure and content. 2540 it’s the new port that we will use it for our database. – The last step it’s the link creating to our workstation. We create a new desktop shortcut to prowin32 application (\Program Files\PROGRESS\bin\ path) and we change shortcut properties: map a disc drive to the folder that stores total server folder: right click over My Network Places and select Map Network Drive…; select a free drive ( ex. N: ) and in Folder area introduce \\192.168.42.10\myApp111 (my myApp111 folder it’s the path where our application it’s stored) and finally we select Finish button. Change shortcut properties in order to use our application configuration file. As you can see the server Sun path stars from total folder and contains mydb.df file. First file path it’s not full completed because it uses map drive setting that was applied. Unix server’s folder myApp111 is the folder that contains that use Progress database. My back-ups location on my server is to /hitachi/backup/ path. Cron’s daemon script generates backups in this location. 2. .gz extension (ex. ronb2005.11.30.bk.gz) – it means compressed backup. Then, follow Starting a database procedure. This it’s an additional step. First, when we want to restart a database we have to check that all the database clients are disconnected. This command shows us if there are connected users and if yes show the users name. We have the possibility to force client’s disconnection. We renounce to this action pressing X key and contact the users in order to disconnect. After few minutes we check again that all clients have been disconnected. saved_back_up.bk.gz file with a smaller size. After a successful result of this command we have the original database backup file saved_back_up.bk. Then follow restoring database procedure.